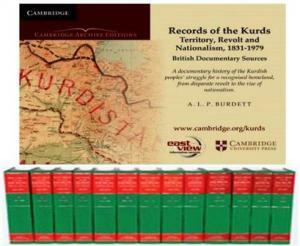 These nine thousand pages of facsimile documents trace early insurgencies directed by the Kurdish people against regional and metropolitan powers, and their interrelations with neighbouring tribes and other ethnic groups at historical flash points, from the origins of nationalist sentiments through a series of disparate revolts in the nineteenth century, and then on to a larger, more cohesive and discernible nationalist movement launched in the aftermath of World War I. They concomitantly depict the extent of territories pertaining to the Kurdish 'homeland', the use of the term 'Kurdistan' generally refers to an agreed geographical area, not to a legal or political entity. Kurdish populated territory evolved over the nineteenth and twentieth centuries, with some regions becoming entrenched, others subject to constant flux. The map box provides illustrations of the changing territory, or those sections subject to alterations and contestation.